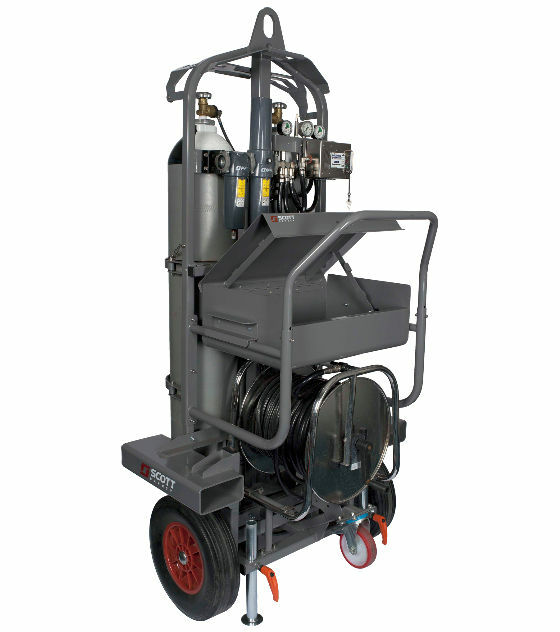 The 3M Scott Safety ModulairMax is a high capacity airline trolley system, approved to supply air with lengths of airline hose upto 105 metres. Built to be compatiable with 2 x 45 litre cylinders giving 24,500 litres of air or 2 x 50 litre cylinders giving 27,000 litres of air, the system is capable of suppling in excess of 10 man hours of breathing air. Options include AFU for filtering an external air supply, a DS4 electronic low air alarm to signal if that external air supply is failing and forklift brackets to enable easily loading of the unit. A lockable storage box is also available that will take tools or an airline BA set and can be easily fitted to the unit. First stage pressure reducing valve featuring non-adjustable, spring-loaded piston mechanism and outlet supply protected by pressure relief valve. Valve body and cap machined from nickel-plated brass with stainless steel spring and hose retainer U-clips. 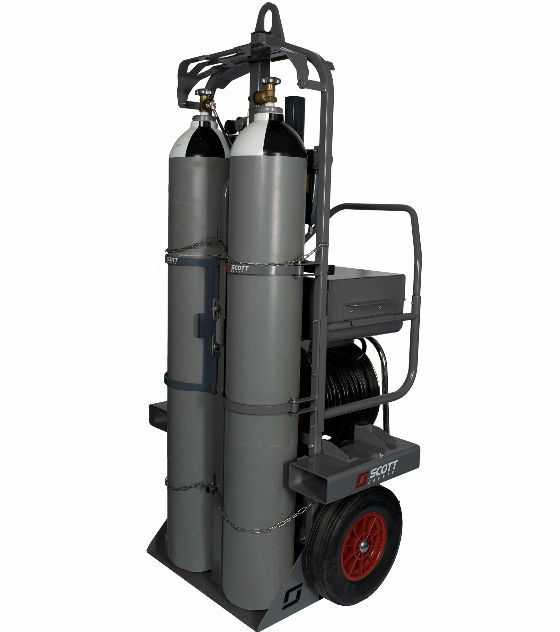 2026831 MM ModulairMax Trolley unit for 2x50 litre cylinders, supplied with 4 man pneumatics, hose reel and lifting eye. High pressure pneumatic system with 55 bar whistle, 200/300 bar cylinder connectors and CEN outlet couplings for up to 4 man use. 2026830 MM-AFU ModulairMax Trolley unit for 2x50 litre cylinders, supplied with 4 man pneumatics, hose reel and lifting eye. High pressure pneumatic system with 55 bar whistle, 200/300 bar cylinder connectors and CEN outlet couplings for up to 4 man use. Fitted with 4 man airline filter unit for external air supply. 2026829 MM-AFU-DS4 ModulairMax Trolley unit for 2x50 litre cylinders, supplied with 4 man pneumatics, hose reel and lifting eye. 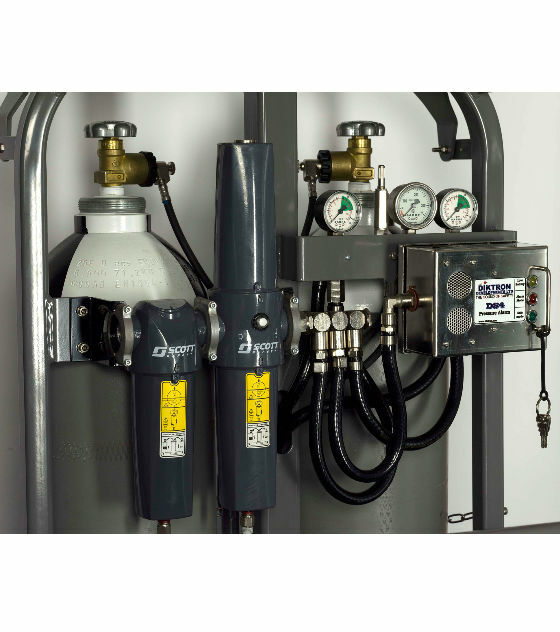 High pressure pneumatic system with 55 bar whistle, 200/300 bar cylinder connectors and CEN outlet couplings for up to 4 man use. Fitted with 4 man airline filter unit and electronic DS4 low pressure warning system for external air supply.